Pokémon Day, or February 27th to most is a yearly celebration of all things Pokémon! The Pokémon Company International usually hosts a wide variety of different events and 2019 is no different! Except, it’ll take place the entirety of the week instead of just one single day! Do you want to join in on the festivity’s? Checkout all the details below! This Pokémon Day is sure to be huge, with exciting news and events celebrating more than 20 years of Pokémon fun. Pokémon Day itself is February 27, the anniversary of the release of the very first Pokémon games in Japan. But the events planned are too big to fit into just one day—look forward to exciting Pokémon Day festivities throughout the week and beyond. Pokémon TCG fans, be sure to check out the Trade & Play events happening at GameStop and Best Buy in the United States, as well as at EB Games in Canada. Meet up with fellow players and collectors to battle and trade, and pick up a free oversize booster pack—containing a three-card mini pack and other fun goodies—while supplies last. The fun starts February 23. Click here for complete details on the Trade & Play events. Settle in to watch all the Pokémon episodes you want when Twitch.tv offers another Pokémon the Series marathon from February 27 through May 5. Fans can head to Twitch.tv/twitchpresents to watch episodes from Pokémon the Series: Diamond and Pearl,Pokémon the Series: Black & White, andPokémon the Series: XY, as well as select movies. Twitch will also showcase some of their favorite episodes and movies all day on February 27, highlighting Pokémon such as Pikachu, Zekrom, Eevee, Snorlax, and others that appear as part of a TAG TEAM in the recently released Pokémon TCG: Sun & Moon—Team Up expansion. Disney XD in the US will join the fun by airing blocks of fan-favorite episodes on February 27 starting at 3:30 p.m. Plus, YTV in Canada will air a marathon of the final four episodes of Sun & Moon—Ultra Adventures starting at 1 p.m. PST. Check your local listings to confirm time and channel. To mark this year’s Pokémon Day, the Pokémon Center is debuting a new line of premium apparel called Poké Ball Classics. The collection includes clothes and accessories featuring a clean Poké Ball pattern that’s perfect for when you want to dress your best but also show off your Pokémon pride. The Poké Ball Classics collection launches February 27 at PokemonCenter.com. Following last year’s big Pikachu Funko Pop! reveal, Bulbasaur is the next Pokémon to get the Funko Pop! treatment. Look for this beloved first partner Pokémon to arrive in Pop! form on February 27. 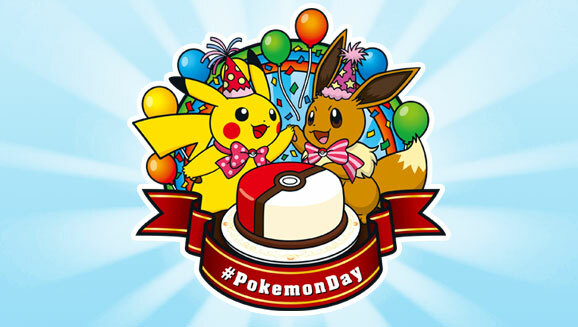 Have fun celebrating Pokémon Day 2019!